Some of my fondest holiday memories involve Christmas Day brunch. My family would gather around the dining table, with Christmas lights flashing in the background, and devour a delicious homemade brunch. Prepared by yours truly. The name of the game at these holiday brunches was indulgent decadence. I’m talking bananas fosters waffles, chocolate chip pancakes with cinnamon whipped cream, and Nutella stuffed French toast. Yes, I gave the gift of diabetes to my family each holiday season. Unfortunately, as we’ve gotten older, my family has spread out across the country, making it increasingly rare that we all get to sit down together for Christmas brunch. However, this year is special because my whole family will be together for the holiday, so naturally, I wanted to continue our decadent Christmas Day brunch. Since becoming vegan, however, I’ve found creative ways to replicate indulgent favorites in a healthier, cruelty-free way. Don’t get me wrong, I’m certainly not serving salad for Christmas brunch. But my version of Christmas brunch these days is less likely to put everyone in a diabetic coma. Like this Overnight Gingerbread French Toast Casserole. It is truly delicious and decadent, but it’s not overly sweet or rich. It feels indulgent but it won’t make you want to fall asleep immediately or put on your stretchy pants. Plus, it’s completely free of refined sugars. 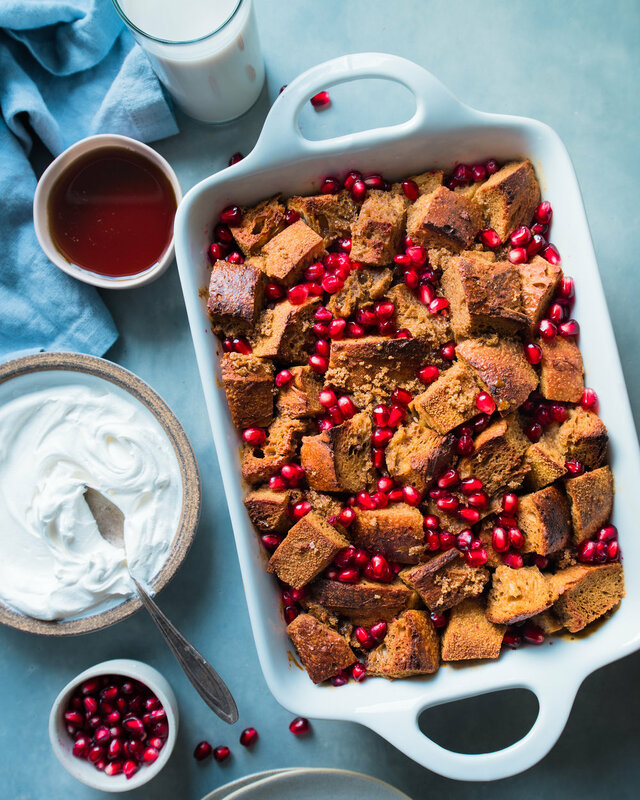 I’d describe it as an elegant version of the classic overnight French toast casserole, with rich, warming gingerbread spices layered in every bite. While it is delicious enough to be served plain with just some plain maple syrup, I recommend making the Raspberry-Cranberry Sauce because the sweet-tartness is the perfect complement. Plus, it’s festive and pretty. Another selling point for this gingerbread French toast is its ease. Once you assemble the dish at night, it requires very little work in the morning, making it the perfect brunch entrée for holiday entertaining. When I say very little work, I really mean it. You just need to pop it in the oven and add a foil cover 20 minutes later. 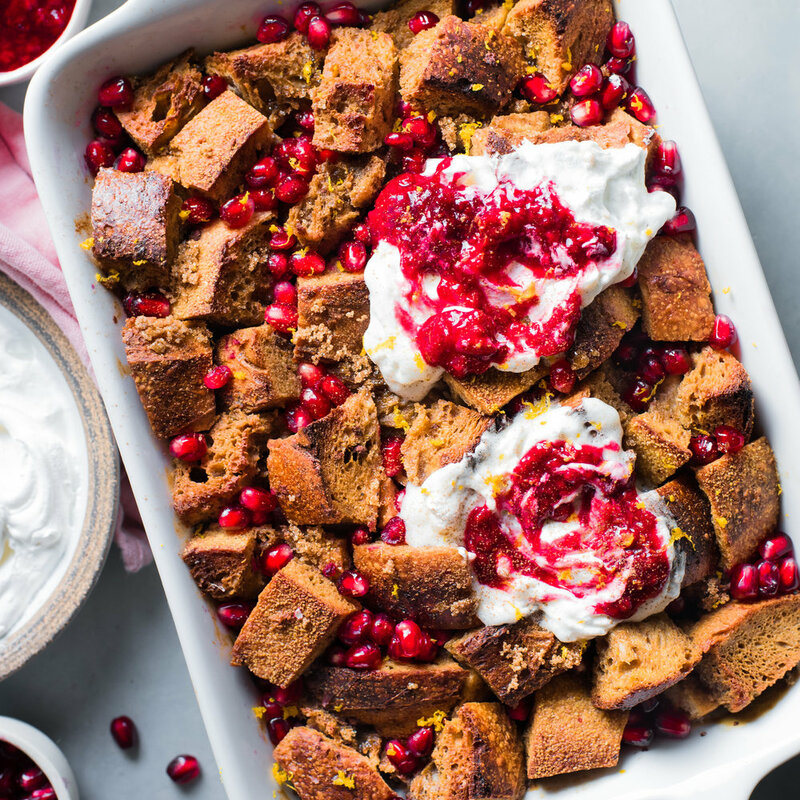 Another thing I love about this gingerbread french toast casserole: the pomegranate seeds. They add a satisfying crunchy bite of juiciness that contrasts nicely against the soft, chewy texture of the French Toast. And again, they’re festive and pretty! Regarding the other ingredients, I have a few pieces of advice. First, be sure to use a loaf of sturdy, rustic bread. No soft sandwich bread here, or you’ll end up with a sad, soggy mess. Not very festive. You’ll want to ensure that the bread is hard and dried out, not soft inside. That’s because there’s a lot of custard for the bread to absorb overnight, and the bread will turn to mush if it’s freshly baked and soft. You can use stale, day-old bread, but my preferred method is to use freshly baked bread and then dry it out in the oven. This enables the bread to soak up the custard while maintaining a soft, pillowy but not soggy interior. Plus, it also maintains the delicious freshly baked bread flavor that you lose when using stale bread. 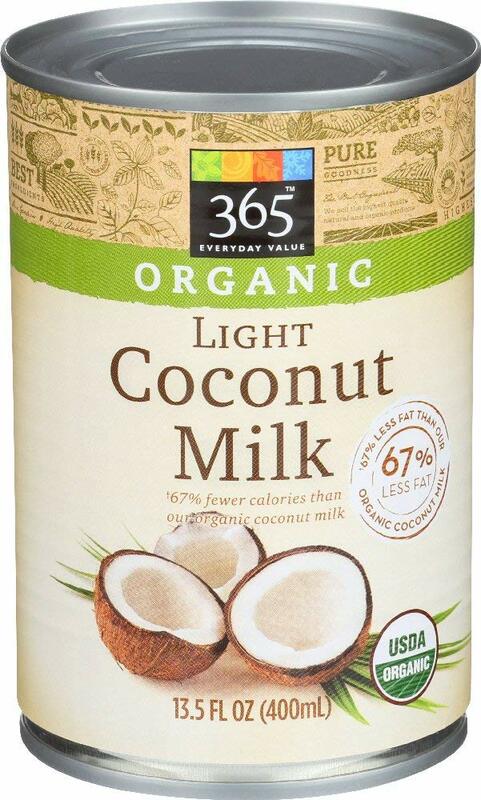 As for the other ingredients, I use a combination of carton almond milk and canned lite coconut milk because the latter adds a bit of rich creaminess to the custard without being too heavy. 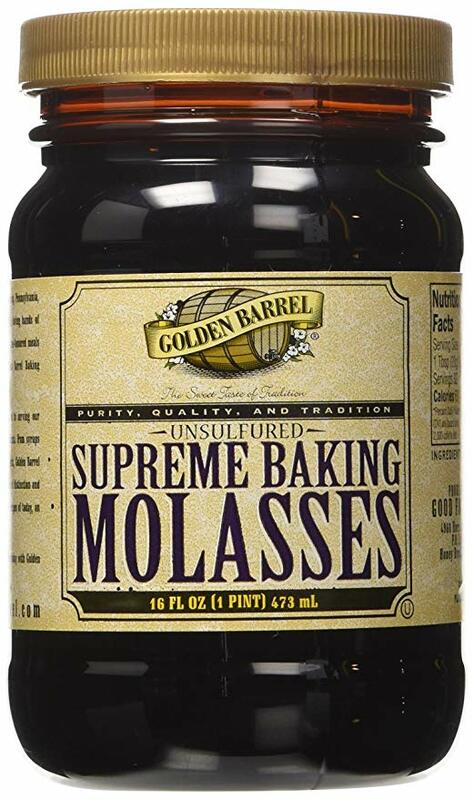 The chickpea flour and nutritional yeast lend a slightly eggy flavor without using eggs, and the molasses is essential for achieving that deep, full-bodied flavor everyone loves about gingerbread. When you prepare the custard, it might seem like there is A LOT of custard, perhaps too much for the bread. But, don’t you worry. That dried out bread will soak up all of that creamy custard goodness overnight, so don’t be afraid to pour it all in. 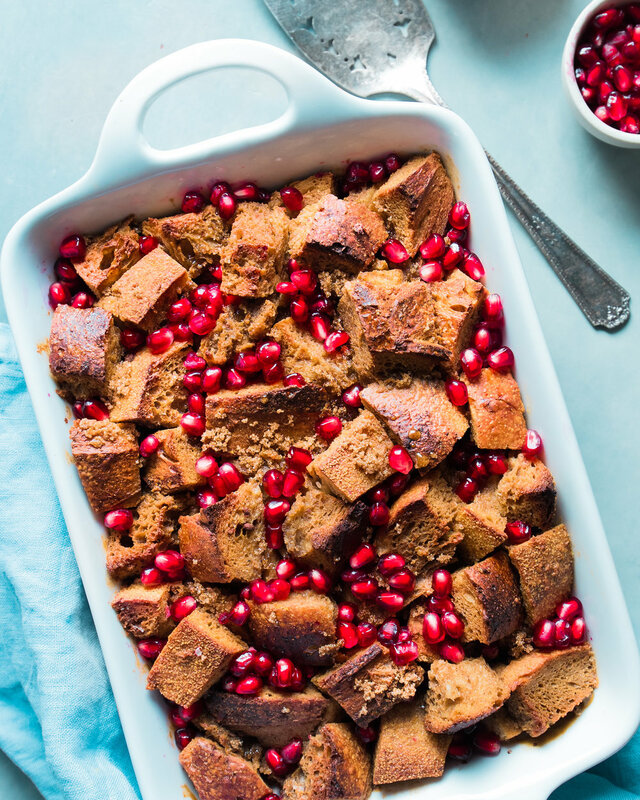 That’s all you need to know about this Overnight Gingerbread French Toast Casserole, so happy brunching! If you are using stale bread, skip this step. If you are using freshly baked bread, preheat the oven to 300°F (~150°C) and arrange a rack in the middle of the oven. Slice the bread into 1-inch cubes (you should end up with 6-7 cups). Arrange the bread cubes on top of a large sheet pan in a single layer. Bake the bread for 15 minutes to dry it out. Grease a 3-quart rectangular casserole dish with oil of choice. Make the gingerbread custard: In a blender, combine the almond milk, lite coconut milk, chickpea flour, nutritional yeast, maple syrup, molasses, cinnamon, nutmeg, ginger, allspice, cloves, salt, vanilla extract, baking powder, and arrowroot powder (or cornstarch). 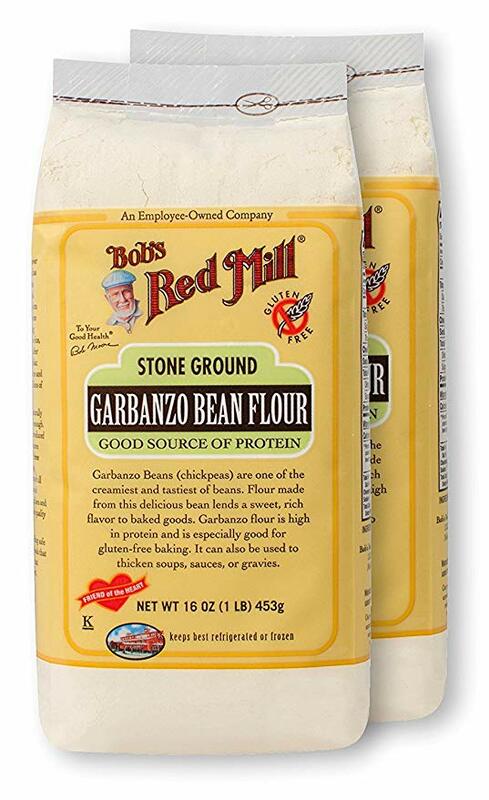 Blend on high speed until the mixture is completely smooth and no lumps remain. Place the dried out bread pieces in a large bowl and pour the gingerbread custard over the bread mixture, tossing to coat the bread cubes thoroughly. Transfer the soaked bread to the greased casserole dish, cover, and refrigerate overnight or for at least 8 hours. Before baking, preheat the oven to 350°F (176°C). . Uncover the dish and bake for 20 minutes. Then cover the pan with a piece of aluminum foil to prevent premature browning and bake for another 30-40 minutes. For a French toast that is still soft on the inside, bake for the additional 30 minutes (total of 50 minutes); for a French toast that is completely baked through, bake for the additional 40 minutes (total of 60 minutes). My preference is to bake it for the full 60 minutes. While the French toast is baking, make the Raspberry-Cranberry Sauce. In a small saucepan, add the raspberries, cranberries, orange zest, water, orange juice, and maple syrup over medium-low heat. In a small bowl, mix together the arrowroot and cold water and stir to form a slurry. When the raspberries starts to lightly bubble, add the arrowroot slurry and stir to combine. Heat for 5-10 minutes or until the sauce is thickened, similar to a runny jam. Remove the French toast from the oven and cool for 10 minutes before serving. 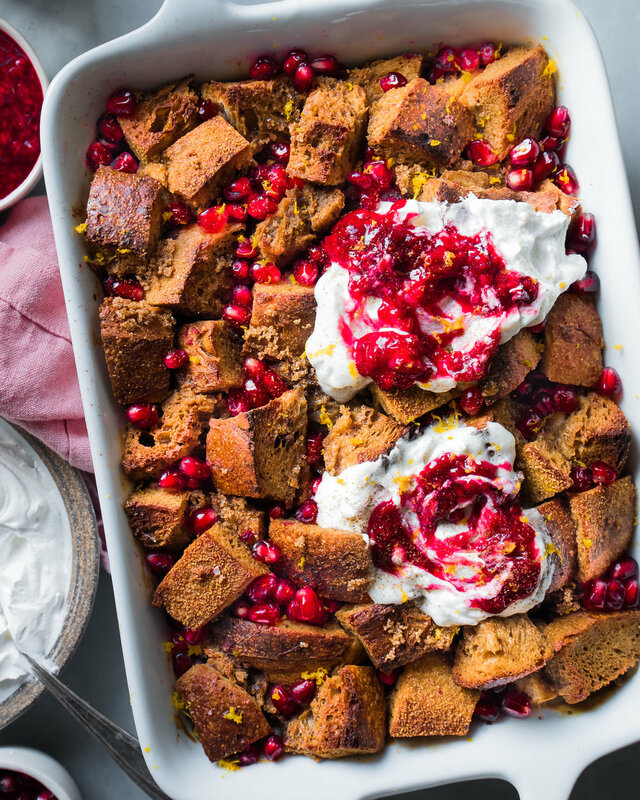 Top with the pomegranate seeds and serve with the Raspberry-Cranberry Sauce and vegan whipped cream.